Those who are trend-conscious know that fashion is nothing if not cyclical. It’s a snake eating its own tail. And, as was inevitable, the mouth of said snake has reached a particularly stiff, hard-to-swallow bit. 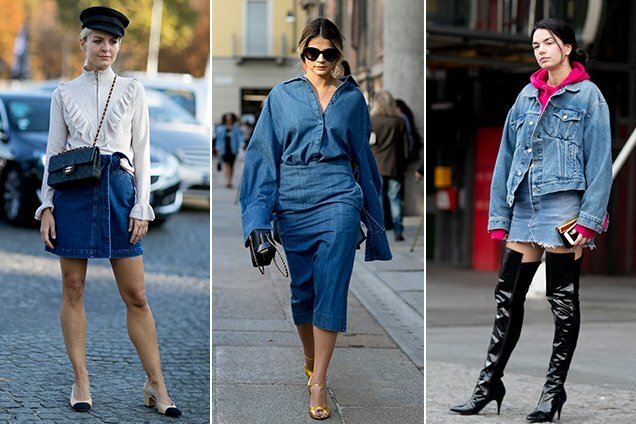 Within the past year or so, the denim skirt, a relic of the early 2000s (when everyone’s style was generally bad), has made a comeback. Lately, Rihanna, Bella Hadid and (her archrival) Selena Gomez have been spotted out and about in the style once synonymous with noughties cultural touchstones like Hollister, Abercrombie & Fitch, Paris Hilton and the cast of Laguna Beach. 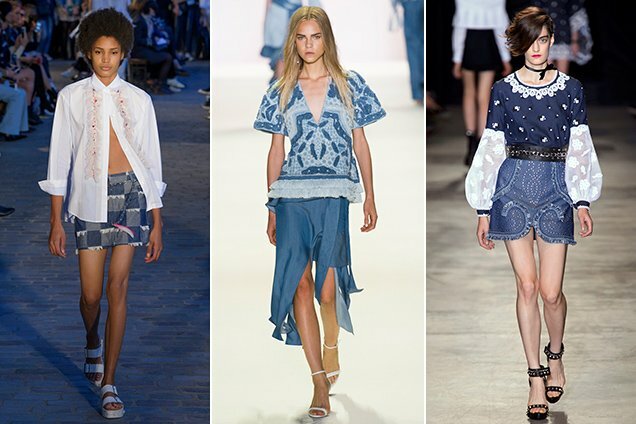 Today’s denim skirts are decidedly chicer than those favored by Paris and Kristin Cavallari, however. They’re clean, polished. Their hemlines are (slightly) longer, their frays more deliberate, their waistlines higher. They come paired with see-through turtlenecks and coordinating denim jackets (Bella), outsize, pseudo-professional button-downs that add interest and coverage (Rihanna), tailored coats, statement purses and hardware-accented brogues (Selena). Still, it’s a hard silhouette to pull off, especially for those of us with more curves and shorter limbs than the aforementioned celebs. Of course, it’s no secret that the traditionally constrictive minis aren’t built to flatter every body type. For Spring 2017, designers offered up fresh, figure-flattery takes on warm-weather denim. Capitalizing on another 2000s trend, Jonathan Simkhai showed an easygoing, asymmetric chambray skirt with strips of hanging fabric. Andrew Gn presented an ultra-embellished, A-line alternative. Paul & Joe kept things short and straight, but upped the ante with a playful patchwork pattern. 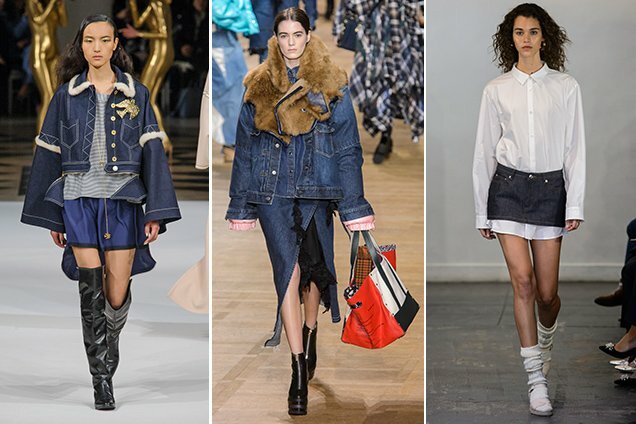 The denim skirt revival continued into Fall 2017. At Alexis Mabille, denim skirts took on a flowy, fuller shape, offset by patent leather knee-high boots. Sacai’s versions were long, swirling and backed by silk and lace. A.P.C. asked that we embrace ridiculously mini skirts for what they are: accents, not true bottoms. Tommy x Gigi’s Venice Beach blowout featured a center-slit denim maxi, belted and worn with a cropped graphic tee — very 90s boho. On the streets, denim skirt outfits came styled with ruffled knitwear and feminine footwear. 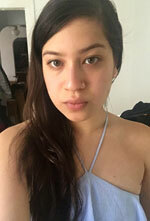 One showgoer introduced a springy alternative to the Canadian tux: a midi chambray pencil skirt worn with a matching button-down of exaggerated proportions. Another kept things casual with a bold hoodie, oversized denim jacket and shiny thigh-highs. Like Leandra Medine, we’re all about complementing our denim skirts with statement socks and loafers, slinky silk midi dresses or structured, cheerily printed blouses. Still not convinced? Trust us, nowadays there’s a denim skirt to suit all shapes and tastes. You’ve got 70s-inspired button-fronts of all lengths and washes, bodycon pencil skirts (a favorite of Nadia Aboulhosn), side-slit maxis, embroidered minis, boxy carpenter skirts…the list goes on and on. See (and shop) for yourself in the gallery below.